I am happy to announce today the release of my printable Quilt Planner Workbook! If you are like me, you scratch quilt designs, do math for cutting instructions, etc on random pieces of notebook and planner sheets or sometimes even post-it notes! And if you're like me you also sometimes damage or lose them or just don't have enough space for everything! 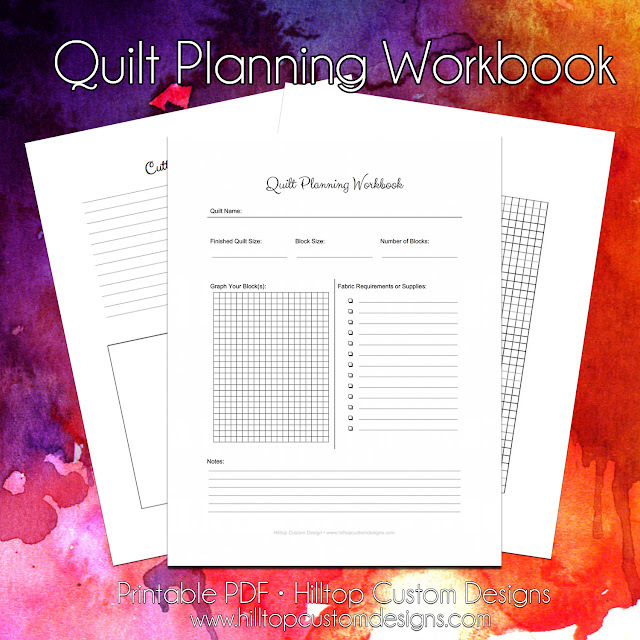 This workbook is a handy printable 8.5" x 11" PDF that allows you to plan each new quilt design in an organized fashion! It comes with three pages that will help you from start to finish with any new quilt design you've been dreaming up but also works great for quilt patterns from online sellers as you can sketch out your blocks preferred color / fabric choices and put everything thats in your head down on paper. I really think you're going to love this workbook, and the best part is it's only $3.00 USD and you can print it an unlimited amount of times!! You could easily slip these in with various WIP tubs that correspond with your quilt project or save them for future reference incase you want to write a pattern. I have listed it on various sites to make it easy for use with local and international customers. Craftsy and PayHip purchases are delivered instantly. However, you can also purchase from my personal shop or PayPal and those PDF's will be delivered via email within 24 hours of payment confirmation. Thanks for reading and I hope you enjoy this workbook! Congrats Amista. I may have to give this a try. I like the affordability of it. I hope you try it out Kathy. It has worked great for me!